Wouldn’t it be nice to have different lines on your phone for work and for personal life? The simplest and most obvious way to do that is to use two different phones. This can be painful and annoying both. Another way of doing this is via the iOS app Flyp. 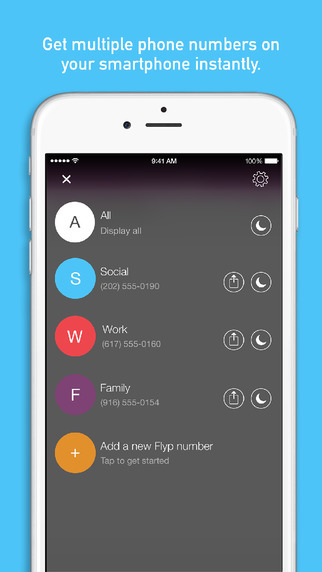 Flyp is an app that allows you to add more than one number to your smart phone. You can add up to 6 different numbers to a single smart phone. Sounds impressive, right? 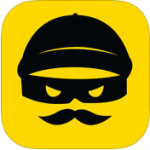 To add to this, it is available for free download from the App Store. It comes with one free number for you to test out the features and the basic options. 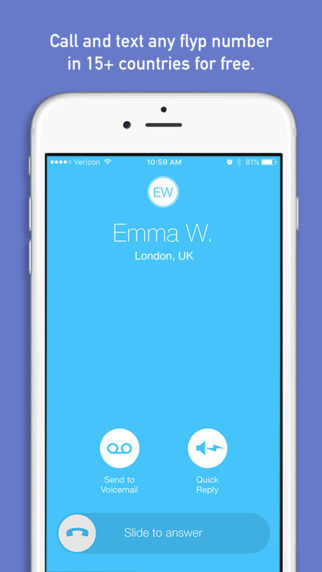 The app first verifies your current phone number and then assigns a new one to you. You do not get to choose the area code or the number in the case of the first free number. The free number and all additional ones can be used to make and receive calls and text messages as you with any other phone number. The app essentially uses your existing mobile number and cellular service to route calls made and received using the Flyp numbers. Voice calls make use of airtime minutes. All SMS texts make through the new number make use of the Flyp system and do not rely on your current carrier plan. This allows you unlimited text messaging. The Flyp app screen is pretty similar in terms of design as compared to the iPhone call screen. This is good as you do not have to step out of your comfort zone to use the Flyp app. you can set a ringtone that is different from your native iPhone one in order to mark calls from the new number. This way, you can know calls from the Flyp number right from the ring tone. You can send calls to voice mail or also use Quick Reply in case you are busy. The Quick Reply allows you to send across an automated voice reply to incoming calls. One of the well thought out features of the app is the Do Not Disturb Mode. If you are out on vacation and do not wish to receive calls from your Work number, this feature can come well in handy. It ensures that you will not be notified of voicemails, calls or texts while you are away. 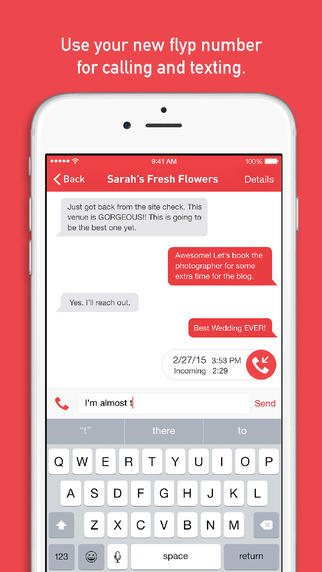 Any calls made are saved in your conversation history. The Flyp free app allows you to use unlimited texts, voicemail, quick reply, a random phone number and 100 outbound minutes. All you need is an iOS device with iOS 9.0 or later versions. Additional numbers can be added for a price. Each additional number costs $2.99 per month or $29.99 per year. This assigns you a premium number wherein you can select your area code, get up to 500 outbound minutes and also customise your voicemail and quick reply. While the cost seems pretty steep, it is much less than that of buying a new number. The only disadvantage is that the Flyp service is currently only available for numbers in the USA.